Liane Christoffersen Nichols is the 2015 recipient of the Peter Melendy Community Builder Award. A lifelong resident of Cedar Falls, Liane exemplifies the community spirit championed by Melendy. Liane was born and raised in Cedar Falls, the only daughter of Iver and Veronica “Verne” Christoffersen. She spent the first decade of her life living in the Black Hawk Hotel, as her father managed that establishment. Her love of downtown, both its history and buildings, was fostered at this time as she experienced firsthand the growth and development of business and industry in that area. 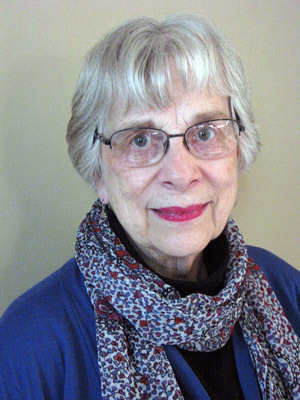 After graduation from Cedar Falls High School in 1952, Liane studied theatre with Hazel Strayer and Stan Wood, and received BA and MA degrees from Iowa State Teachers’ College, now the University of Northern Iowa. She taught English and Speech in the Cedar Falls schools for twenty-eight years, introducing her students to both classics and cutting edge literature and theatre. In 1978, she and Margaret Willoughby founded the Cedar Falls Community Theatre. The Cedar Falls Community Theatre productions were first staged in the auditorium at Holmes Junior High. In 1991, the Regent Theatre was gifted to the Cedar Falls Community Theatre, and Liane was actively involved in raising money to restore the building. This $1.2 million dollar community wide fundraising project was completed in 1994, and the Cedar Falls Community Theatre began staging productions at the Regent that year. The Oster Regent Theatre now provides not only a home for the Cedar Falls Community Theatre, but anchors our downtown district in an architecturally and historically important building. The successful restoration of the theatre provided inspiration for further building restorations on Main Street. These aesthetic improvements to the infrastructure of Main Street helped to fuel the economic rebound of the area after the downturn of the 1980s. Liane continues to serve as artistic director of the theatre and has directed and acted in dozens of successful productions. In addition to her lifelong commitment to downtown Cedar Falls, Liane promoted Cedar Falls by hosting foreign students in her own home for many years through Youth for Understanding. Liane’s love of Cedar Falls and its history has been further demonstrated through her commitment to the Cedar Falls Historical Society. Whether in her service as a member, a board member, or as a performer during the Society’s Cemetery Walk, Liane has shared her enthusiasm for and knowledge of Cedar Falls’ history and the importance of preserving it. Liane volunteers her time to assist others in the community. She is a reader for the Iowa Radio Reading Information Service, which broadcasts readings of the local newspaper to vision-impaired listeners. She also volunteers at Sartori Hospital’s Surgical Waiting Room, serving families whose loved ones are in surgery. She is an active member of her church, St. Luke’s Episcopal, and serves the church as an ordained deacon. Liane’s one-woman production of “Julian” was another example of a community service. Through St. Luke’s, she is involved in the community meals program and Meals on Wheels. Liane volunteers her time, her personal resources, and her skills for the betterment of the whole community. She is a shining example of the community spirit and commitment to Cedar Falls that Peter Melendy espoused.